Keep your azaleas healthy and beautiful. 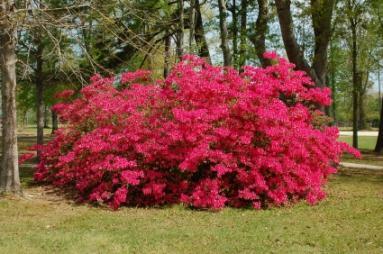 Azalea health problems can be frustrating for the home gardener. By being aware of a few of the more common concerns and how to remedy them, you will be able to enjoy your azaleas longer. If you don't yet have azaleas, having this knowledge now will assure fewer problems later. Leaf Spot Fungus: This is characterized by red to brown colored round spots on the leaves. Normally this problem strikes during late summer. Spraying your shrubs with a fungicide, such as Zineb, during late spring will prevent this problem. Petal Blight: Tiny, bleached out spots that spread over the entire underside of the petal is known as petal blight. Combat this issue by spraying the flowers with a systemic fungicide like Benomyl every five days while your azalea is blooming. Wilt Fungus: This is evident when new shoots on a branch wilt and turn brown during mid-summer. In serious cases, the entire shrub is affected. To control this problem, affected branches must be removed and destroyed. If the entire shrub has been affected, it will need to be removed. To prevent wilt fungus, be careful not to splash mud on the plant while watering because the spores of this fungus are found in the soil. Leaf and Flower Gall: This can be seen by swollen, abnormal flower and plant tissue, and flowers and leaves that become curled and waxy. Hand pick affected parts of the plant and destroy them. Other azalea health problems are usually caused by simple things like not enough humidity. Azaleas used as houseplants commonly have problems with buds or leaves dropping off of the plant. There are hundreds of types of azaleas. Most have low nutritional requirements, but they are still important to meet if you want your azalea planting to be successful. A healthy plant is more likely to be able to resist pests and diseases. Nitrogen: Not enough nitrogen will produce leaves that turn yellowish-green. This can be amended with ammonium sulfate in the soil. Phosphorus: Dull leaves with a reddish underside are evidence of low phosphorus. Potassium: A deficiency results in yellowing between the veins of the leaves. This is known as chlorosis. Iron: Iron deficiency may start out with chlorosis, followed by complete yellowing of the leaves. Calcium: Chlorosis, along with curled leaves that have burned tips is evidence of a calcium deficiency. Calcium sulphate added to the soil will help. Simply using a slow release fertilizer designed for azaleas and rhododendrons, and making sure that you plant in a rich, well drained, acidic soil will prevent most nutritional problems in azaleas. There are a few pests that enjoy dining on your azalea shrubs. Lace bugs are one of the most common. Tell-tale signs of lace bug infestation include whitish foliage and black bugs on the underside of the leaves. Insecticidal soap is very effective in controlling lace bugs. Azalea Bark Scale-this appears as a white, waxy coating that the red females use to cover themselves as well as their eggs. You may also see cottony masses in the forks of the branches of your azalea. Affected branches can be removed and destroyed. Azalea Caterpillars-recognized by red front and back ends and yellow stripes, these pests are controlled through hand-picking. Leaf Miners-larva causes brown blisters on the leaves, as well as curling of the leaf edges. Try an insecticide containing permethrin or cyfluthrin. Thrips-causes silvery-white bleached spots on leaves and petals, and can be controlled with insecticidal soap. Most insects can be effectively controlled with a good insecticide like Bayer Advanced Multi-Insect Killer.